The two emails came as a complete surprise. The first one was easily dealt with once the Nigerian Prince had my bank details, but less so the news from Mr Hindley (aka the boss). 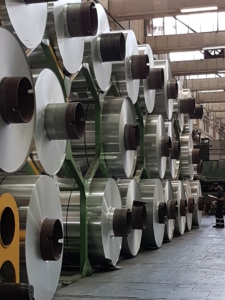 It informed us that the next team meeting would be held at Bridgnorth Aluminium (producers of aluminium lithographic printing plates and foil stock), which would include a plant tour of the casthouse and rolling mill. It wouldn’t have been my first choice – I hear Mauritius is lovely in Spring – but I have been working for Alupro for over 20 years and this has never happened before. It certainly promised to be a whole lot better than that school trip to Wigan bus depot. Arriving at Bridgnorth Aluminium, we were treated like royalty. Maggie in particular was so helpful and the lunchtime spread made the sandwiches we offer our guests look like the reduced price aisle at the local supermarket (only kidding). What caused much amusement from the team was the ‘dressing up’ in the safety gear for the plant tour, white ankle socks over black tights are only a good look during an eclipse or a winter power cut. We were told that the tour would take around 2 hours! Yes, you read that correctly – the same length as a couple of episodes of Game of Thrones. What on earth were we going to see? So, looking like Coco the clown on dress-down Friday, with safety shoes and glasses on, along with hardhats and protective jackets, we were split into 2 groups for a tour of the 120 acre plant, starting with the casthouse. Our guide explained it was only primary aluminium and in-house production scrap (post-consumer aluminium scrap is not suitable for their process) that is melted in their furnaces (temp ranging from 400 degrees centigrade to 700!) We were stood approximately 3-4 metres away from the furnace and the heat was pretty overwhelming. I can’t imagine how the men clearing the dross from the furnace cope with it – if only horses sweat, then I was glowing buckets. The molten aluminium is poured into adjustable casting moulds. 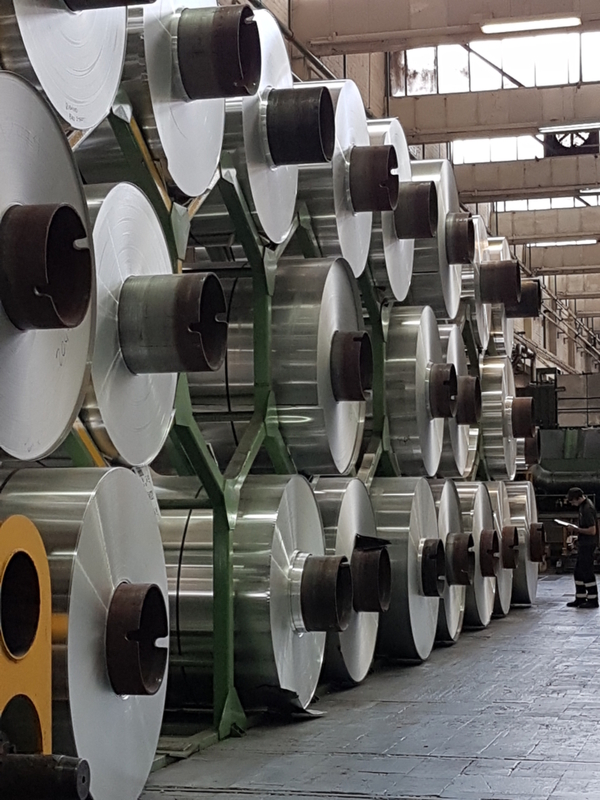 The slab of aluminium is cooled by – our guide referred to it as – a ‘water curtain’ (which I believe is a technical term for a curtain of water). The rolling slab is sawn and scabbed to remove the cast surface before pre-heating to 500 degrees C. The slab is then processed on a hot rolling mill, which brings us to the next part of the tour – in the rolling mill. I think I wouldn’t be alone in saying this was probably the highlight of the tour. The aluminium slab (width at this point is approximately 60cm) is passed through a hot rolling mill. The aluminium is rolled onto a long plate in a series of passes back and forth. I likened it to rolling out pastry and with each pass the slab decreases in thickness until it reaches 2mm (no longer like my pastry). This takes approx. 10 passes. It was quite amazing to see. The slab is then cold rolled and processed further through heat treatment and a series of cold rolling passes. The coils are then trimmed, levelled and de-greased (the material needs to be free from any imperfection). The coils have their own identifying mark so they can be traced back to the factory. The coils (now quality lithographic product) are shrink wrapped and stacked in the warehouse ready to be supplied. Two hours was over and honestly it had gone quickly. There was a lot of technical information to take in that I admit did go over my head (by no more than several metres), but I think I got the important points. I am not particularly patriotic (unless I am supporting the GB squad at the Olympics) but in a small corner in Britain, it was really heartening to see people doing ‘proper jobs’( i.e. not sitting at a desk like most of us) and producing and manufacturing a product of quality that is supplied to the world. That, is something to be proud of. Now, I just need a word with Mr Hindley on why this outing took so long to do….